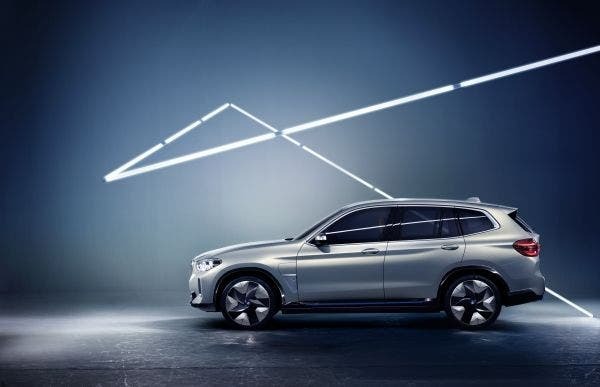 In the class of luxury midsize SUV/CUV, we have now or will relatively soon have 5 new fully electric vehicles that are serious all-around usable cars. Oops, in the USA, half the cars are not called cars but trucks. 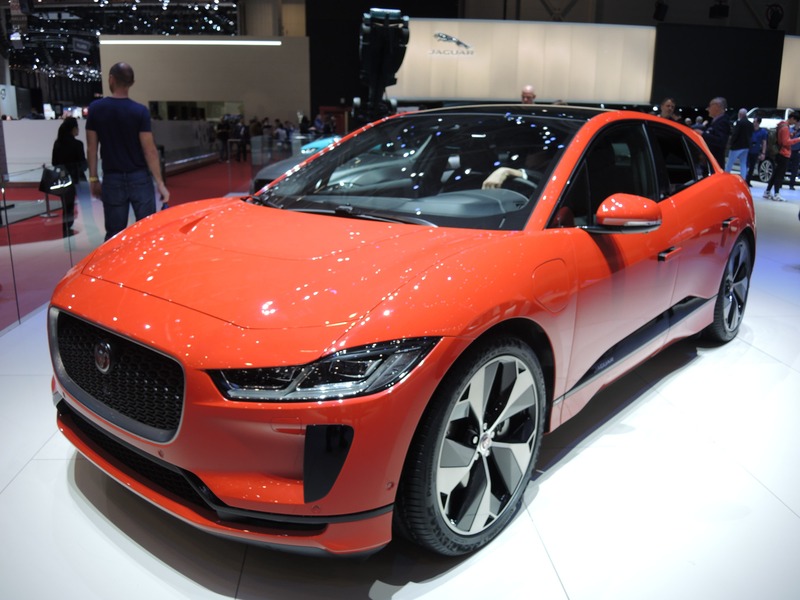 These vehicles are the Jaguar I-Pace, Audi e-Tron, Mercedes EQC, Tesla Model Y, and BMW iX3 — placed in order of expected start date of sales. The only one not yet presented to the public is the Tesla Model Y, due to the well known Osborne effect. Tesla is just reaching volume production of the sedan sister Model 3 and trying to fill the demand for this size of car, so it does not need the distraction of the next model taking sales from the current bestseller. Most news outlets have positioned the four horsemen Tesla Killers as competing with the Model X. This is logical, because it is the only Tesla SUV or CUV at the moment. It is also wrong — a 3 year old, large, 7 seat, 3 row vehicle with prices in the range of $100,000–150,000 is not in the same class as next-generation, 5 seat, 2 row, $70,000–100,000 midsize SUVs/CUVs. The promised Model Y, based on the same platform as the Model 3, is in that same class. The Model Y and the BMW iX3 will be the last available, coming at about the same time, presumably the second quarter of 2020. In the below table, I have shamelessly copied some numbers from ev-database.uk. In the table, I compare what we know about these 5 vehicles. 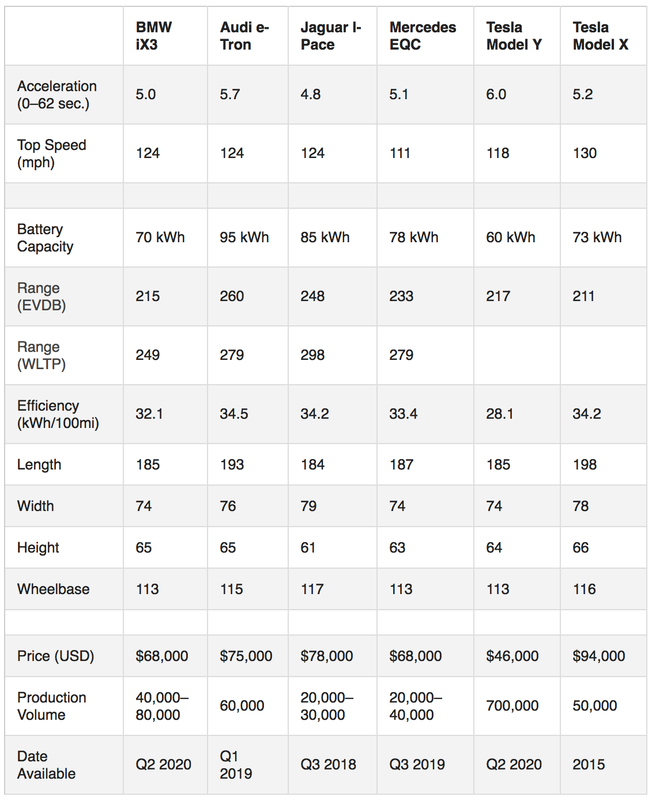 The numbers for the Model Y are guesstimates I made based on the Model 3 and Model X. The Model X is added as a reference. It is not clear whether the specs used above for the announced models are the top-of-the-line specs or base specs. But looking at the range, there is not really room for a trim with lower specs. Without clear statements, I treat them as the only trims for these models. The volume of the iX3 is based on the expansion of factories in China, with an extra capacity planned for 130,000 cars for the X3 and iX3 together, plus needed extra capacity for the 6 BMW models already in production at those plants. The production is primarily for China in order to comply with the local ZEV mandates. 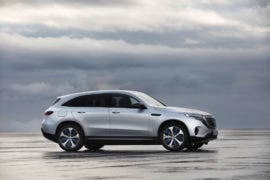 The EQC volume is guessed based on the slow market introduction planned by Mercedes-Benz to forestall large recalls and warranty claims. The most glaring difference between these five models is the price. The Model Y price is expected to be $20,000–30,000 lower than the competition. One of the explanations for this price difference is the planned production volume being 10 to 20 times higher than the production volume of the competing models. Another big difference is the efficiency. One might think that with the bigger battery sizes, it becomes less important, but it influences the charging speed as expressed in miles per minute. And it is getting worse at higher speeds, like on the highway (dare I say “Autobahn”). It also affects acceleration. The Tesla will as usual be futuristic and have spartan aesthetics, while the others will have an abundance of dials, gauges, and switches. All five carmakers have a reputation that they know how to glue a car to the road, so there should be not much difference in handling. The Electrify America network in the USA and the Ionity network in Europe are expanding fast, but in 2–3 years, they will not be anywhere near the Tesla Supercharging network. The Model Y will have a Long Range model and a Performance model that beat both the range and performance of the others, and will still be below the average price of these cars. This competition will be mainly on the European market. When Tesla reaches the old shores, any teething problems with panel gaps will be history and the quality of all five will be as expected of cars in this class. A logistics hell like we see now with the Model 3 and recently in Norway with the lack of good-quality car carriers is also unlikely to repeat. I expect the main drivers of the competition to be price and availability, with the early advantage to Jaguar, Audi, and Mercedes. They can hope for some delay from Tesla, because Tesla will first service the home market in the USA, but when Europe’s Gigafactory 4 starts production, that respite will be over. Looking at this competition, I wonder what can be their influence on the market. Will these four offerings steal some sales wins from Tesla Model Y, or will they validate the concept of electric SUVs and enlarge the market to a size that make all five stay production constrained for a few years? That is the optimistic view. The pessimistic view is that one or more among them will befall the same fate as the Chevy Bolt, competing nicely until Tesla comes to market. When Tesla shows what is possible at what price, their sales could plummet. In 2020, some regulations a bit like Corporate Average Fuel Economy (CAFE) regulations but in the EU mandate that carmakers have an average of 95g/km CO2 emissions. The penalty for every gram above this threshold can get into the billions of euros per year. This is far more serious than the CAFE standard in the USA. These four Model Y competitors are not on the market simply because these carmakers have seen the light. They are on the market because they can not afford to not have them on the market. The price of these four is high in part because they like to show that they can make a profit on electric vehicles. But in the end, giving away 20,000 or 30,000 vehicles for free will probably cost less than paying the fine. This could become a very interesting competition. Images: Jaguar photo is by Jos Olijve. Others are from their respective media kits.